Reports state that only 30% of UK workers take a proper lunch break every day that they’re at work. Taking regular breaks in the office can be a simple necessity that is overlooked. We’ve all been guilty of replying to that “quick” email or getting caught up in a work-related discussion in the office. But by not physically removing yourself from the situation and taking your entitled breaks, your outlook towards the rest of the day is impacted significantly and affects the level of work you deliver. Only by removing yourself from your desk completely are you able to ensure that you won’t get caught up in work-related tasks during your break. Not only does this enable you to recharge your batteries fully, but it will also encourage your colleagues to do the same. Utilise the breakout area provided by your employer, partake in outdoor group activities, or arrange a mini road trip to the local supermarket or café with your fellow colleagues. Recognising your employees need for an inviting breakout area is a good opportunity to create a space where they can rest and build strong colleague relationships. The focus should be to incorporate other means of entertainment besides phones, tablets and computers. You could lay out the latest magazine editions or the current book reads to stimulate the mind, stock up on board games to bring your employees together, or introduce competitive sports such as tennis table and air hockey to encourage team work. Professionals advise all UK workers to opt for a nutritious packed lunch at work. Ultimately, helping you to avoid the mid-afternoon crash that most experience when indulging in calorific or sugary meals. However, choosing to skip lunch altogether is even worse. By not consuming the right nutrition, you’re forcing your body to run on a low source of energy until you essentially run out. This habit can lead to an unhealthy diet of binge eating, affecting your overall productivity both in and out of work. While you can’t control what your staff eat, you can supply healthier snacks as opposed to biscuits and sweets which ensures your staff are fuelling their bodies with the correct energy. This also encourages staff to take more mini breaks away from their desks. 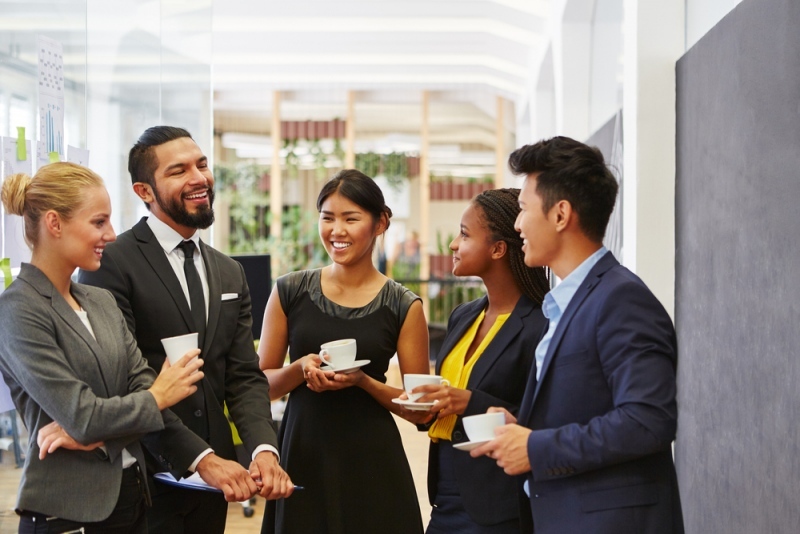 In addition to supporting full, wholesome breaks and numerous mini breaks, employers should prioritise arranging social events for employees to attend. This has been shown to improve social skills and building stronger colleague relationships. Undoubtedly, this will provide employees with the courage needed to invite their colleagues to join them on their lunch break, whether they’re taking advantage of the breakout area or going out. Don’t forget to extend the invite to everyone. When it comes to breaks and social events, it’s easy to forget that your boss is also human and would appreciate taking some time out of work. With everyone recharged and motivated to face the rest of the day, you’re able to work more efficiently as a team and confidently bounce ideas off each other. Naturally, if you’ve got a high workload or can easily get swept up in your work, it will be difficult to introduce this new routine into your work life. Even harder to remove yourself from the internet and digital world when it’s at your fingertips. After a week of implementing this into your routine, you should start to feel less lethargic – particularly in the afternoons – and feel like you’re contributing and completing more in your work day.